Hello there Everyone - Cy Bear back once more, and wishing you all a Very Happy Easter from both Isobel and Me, and the various Coldham Cuddlies who remain in the Storage Area awaiting Forever Homes - from anywhere they may need to travel to! This week, I'm going to tell you about four new Teddy Bears, made from the same pattern that I am made with. Two of them were made with Silver Grey Plush fabric, and two in Yellow (or Oatmeal as the supplier insisted on calling the fabric colour!) plush. One Grey and One Yellow Bear were ordered by a good friend of Isobel's family, a fellow worshipper at St. Barnabas Cathedral, who wanted to give two young boys a special gift before they left with their parents for a missionary life in Papua New Guinea. She had watched both little fellows grow from being babies to the ages they currently were (something like 6 and 4 respectively), and wanted them to have something special to take with them to remember her by. So, just after the Clerical Bears had been introduced to the world, she began on the Silver Grey Bear. He eventually ended up looking like this and originally had both arms and legs that moved (as in the picture earlier). However, after a week or two, our Buyer decided she would be happier if only the legs moved, so both Bears returned for a brief spell in the Animal Toy Hospital, to have their arms sewn on to their respective bodies. The Silver Grey Bear's face ended up looking somewhat solemn - but MsJP, who ordered them from us, liked this expression, so we ended up calling him Solemn Grey Bear - for the purposes of listing him on our Shop (www.etsy.com/shop/coldhamcuddlies). 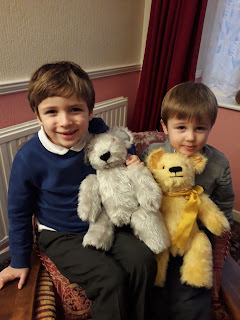 The photo of Yellow Bear shows him with his arms sewn in place (whereas Silver Bear's picture does not) - and keeping his arms immovable means it's easier to get both Bears to sit comfortably when being hugged as happened to these two eventually once they'd been introduced to their Forever Friends. Then, in the last couple of months, we got a request in from a long-term family friend, for two copies of these bears. MrsCC-F actually lives in Bedford, New York State, USA but for some time lived in a small village in Normandy, France where Isobel's sister- and brother-in-law have lived for the past 30 year. She had ordered a similar bear for another family member once before. He looked like this fellow - who has proved to be a popular guy over the years" too. This time, Silver Bear was destined to be a Forever Friend for a young man, called Thomas, who is grandson to a friend of hers and lives in the same village in Normandy, or nearby. The Yellow version is destined to become the Forever Friend of MrsCC-F 's newly arrived Grand Daughter, who lives with her in New York State. This really does show just how multi-national Coldham Cuddlies has become over the 9+ years we've been in existence - a fact we are delighted to crow about!! 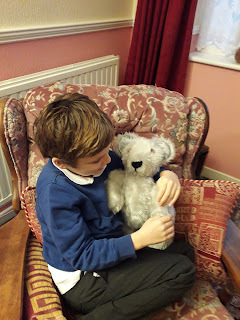 In her order for this Silver Plush Bear, MrsCC-F asked Isobel to both wrap him up in Easter paper, and also include a message - in French - explaining that the package was intended for their friend's grandson. There's a another photo of the latest Silver Plush Bear, sitting on the paper in which he was wrapped up, and then wrapped in bubble wrap. The whole package was then placed in a polythene mailing bag and sent off to Normandy at the beginning of April. The New York State-bound, Yellow Bear was sent off about 5 days later, and was wrapped in our normal way - chemical free tissue paper, then in bubble wrap, and then placed in a similar polythene mailing bag, and posted the normal way for all Cuddlies travelling overseas - Royal Mail Air Mail Tracked and Signed for. (We've just checked on the Royal Mail website, and find that this package reached Bedford, NY on 18th April!) We're delighted. We did want both Bears to get to their individual destinations in time for Easter, although Yellow Bear is actually intended as a first birthday present for MrsCC-F's Grand Daughter sometime in June! The original also does have a somewhat crooked smile! Isobel will endeavour to create him with a slightly more "normal" look. (It's difficult to change the original look here, because as the facial features are done in black double knit yarn, there is a tendency for a mark to appear/stay whenever a correction is made). 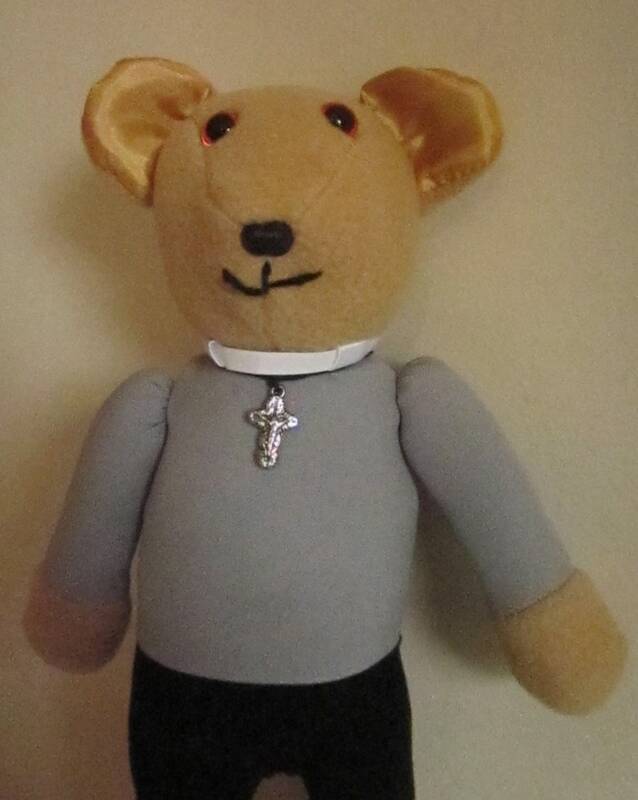 Vicar Bear is made slightly differently to all the other Clerical Bears, in that his body is not separate from his clothing - and he's also a little bit taller than all the others. (All the other Clerical Bears, Men and Women, have separate bodies, that are individually dressed). MsDB, our customer, wants him to have the same colour shirt and trousers, as well as the crucifix - but as many of you may know, Vicars - and their lady equivalents (Peter, Isobel's late husband used to call them "Vicarenes", which I think is a rather nice, grand title for these important ladies) often have their shirts in many different colours. Isobel is more than happy to accommodate all reasonable alternative suggestions!! She's already got cream, blue and pink fabrics and stripey patterned alternatives in stock, if anyone else would like to order one!!! That's it for this week: I think next week, if we live and do well, I'll show you the photos we received from the Thornton family (Forever Home to my good Friend Teddy Bear Thornton, a.k.a now as Benjie Bear) and tell you more about the recent additions to the Clerical Bear Family - Sister Bears called Sister Breda ("Blue Nun"), Sister Clare (Brown Habited Nun), Sister Mercy, and Sister Rose (our "Pink" Nun). I included a photo of the quartet at the end of last week's post! Do hope you're all having a great Easter long week-end. See you all next week - all being well. Hello again, Everyone - your Friend, Cy Bear delighted to be back with you once more! Before going too far, however, I need to tell you that there's no problem about telling you how the Coldham Cuddlies Toy Animal Hospital operates, and what happens to their Patients. We all love Everyone to know how we looked when we arrived, and how we go home better looking (in some cases), as well as different. This week, we have two Patients to tell you about - as I promised I would last week. Also, I'm pleased to tell you that we have the missing photographs, plus some extra information about Teddy Bear Thornton - TBT (known now as Benjie Bear) that I mentioned in last week's post as well. Will share those with you once we've completed this week's news stories. Very shortly after TBT arrived in our home, Isobel got a telephone call from a worried parent (Dad of a little girl whose Best Friend had got too close to an electric heater, and ended up with a damaged face, with no eye on one side, and a bad hole in one ear). He'd found out about the Coldham Cuddlies restoration services by "googling" (whatever that is!) and decided to see if Isobel could help. He was scheduled to be driving past our driveway a few days after the contact, and asked if he could call in and show us the damage. We found out that this cheerful (or normally cheerful) chappie was called Lollopy Dog and his Forever Friend - a small girl - took him everywhere she went. However, she wanted him to look as he'd done before he got too close to that fire - and was prepared to let him stay with us for as long as it would take Isobel to get him right. From a quick inspection (it was Dad's lunchtime, and he had a meeting to go to that he didn't want to be late for), Isobel felt we could do something to assist. So Lollopy Dog stayed in our bedroom with me, until we could find suitable fleece fabric with which to undertake the necessary repairs. We'd got brown fleece already in store: it was the pale yellow that we needed to match. As we were still waiting for TBT's mohair fabric to arrive from our supplier, Isobel got on a 'bus next day to see if she could find the fleece she needed at one of our local suppliers - the main one, in nearby Mansfield. She was in luck, with a colour match - even if the fleece fabric was somewhat different (it was actually a piece of felt) - so we could begin work pretty well immediately. Then, out of the blue, one of our previous customers for small Bears this time - MsHG - (who lives almost at the other end of the UK from us - in Devon) contacted us to see if we could help her out with a new Bear purchase she had just made. He was a finger puppet when she purchased him from somewhere "on-line" but really wanted him to be able to sit/stand on his own when he came to live with her - and wondered if it would be possible? That didn't sound too much a problem, and as we were then very much in the treatment/waiting mode - what with TBT and Lollopy Dog staying with us - Isobel asked MsHG to post him to us. You can see from all these pictures, that Little Pooh Bear was quite a lot smaller than TBT, who is shown minus his right ear (which had been sent to the Mohair Bear fabric supplier for his new coat to be matched). With Isobel now waiting to begin work on Lollopy Dog and TBT, she looked through our fabric stash, and found a suitable piece of fleece (which is what Little Pooh Bear is made with). Although it wasn't an exact match, as he was going to be standing on the new base and therefore the work done not in sight, we decided to go ahead and get him back to Devon as quickly as possible. The job didn't take long. It consisted of Isobel putting enough polyester stuffing in to the hole where a finger had previously been used to manipulate Little Pooh Bear when he was a Finger Puppet, sewing the resulting seam caused by the new base so that it looked as though he'd always been a small, standing Bear, and then wrapping him up and posting him back to Devon. and as far as we now know, he's been travelling around in MsHG's handbag ever since. Little Pooh didn't have any mouth: and we weren't asked to provide him with one - so we didn't! Now back to Lollopy Dog and his special treatment. He was quite a handful to cope with, because in the end, Isobel had to replace the whole of his front head and face, as well as both ears. (Using felt instead of fleece really necessitated this drastic change). This required the existing head to be de-stuffed, and the damaged front of the head to be cut away from the back, which was retained. She then threw away the damaged ear, and took a template (drawing round the left ear on cardboard), and cutting out the resulting shape for both the ear (cardboard) and the front face (using the existing fabric shape as a guide). The brown fleece we had in stock was somewhat darker than his original ear colour, so we decided he would look "odd" if both ears were not the same when he returned home. Isobel managed to rescue the one remaining eye, made a template for a new one, and using the same fleece used with the new ears, made two new eyes, so that they too matched each other. Lollopy Dog's nose was re-used too, and as his smiley face had fade a bit with all the loving he'd gone through, Isobel re-embroidered that as well. She had one or two worrying moments - when she couldn't remember exactly how the face pieces originally went together. But once she'd fiddled around a bit, all went well, and Lollopy Dog ended up looking like this. While Isobel had been handling Lollopy Dog, she noticed that he was pretty floppy, and decided he could do with some bulking up. Realising that part of his overall charm was that he should be floppy, (we guessed that had something to do with how he was called!) 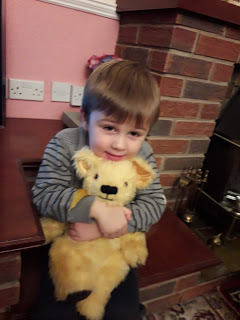 she was careful not to make him too firm, but at least now, when Lollopy Dog and his Forever Friend are together, he'll be more of a cuddly armful to be played with - and, hopefully, last for many more years than he might otherwise have been able to do. Since our Patients returned to their respective homes, Isobel has been busy with the Clerical Bears. They have increased in number - with the whole collection now numbering 9. Plans are being laid for another session of Sunday morning airings after Easter - to remind people that they are still available, especially as St. Barnabas Cathedral is about to start a year long celebration of being 175 years old this year. She's also made four Big Bears (using the same pattern as me) recently, so we'll be telling you about these new Coldham Cuddlies in the coming weeks, too. They're all destined to be well-travelled Bears when they've got to their eventual destinations! Meanwhile, that's it for this week. Hope to be back again sometime next week-end, but it is Easter Week-end, and who knows what might happen then? Have a very Happy Easter, Everyone - until we meet again. I'm so pleased to be back once more this week, and delighted to be able to tell you all about the final episode of Teddy Bear Thornton's treatment, and his progress to his future life. This is the picture with which I ended our post last week, showing how TBT's facial features came about, and using the eyes with which he arrived in the Animal Toy Hospital last November. Also included are the newly re-created arms (with new brown leatherette padding replacing the pink and red baize used earlier for his paws) and the body pieces sewn together ready to be stuffed as well. The legs were there, but somehow got missed from in the picture! Once all the separate pieces had been stuffed, Isobel attached the limbs to the still empty body, then filled in the body, and added TBT's completed Head. Early in the New Year, MsAT sent Isobel a message a few days after he'd gone home with her. Apparently, he now has a new long term name - Benjy (MrsAT's Grandfather who originally gave TBT to her when she was a young girl was called Benjamin, I believe - so that's rather appropriate, isn't it?). She also sent us a couple of picture of Benjy in his new home, but presently, Isobel can't remember where she "hid" it among all her files. I'll see if she can get them sent to us again, and we'll include them in another post soon. Meanwhile, I'll close this episode - and look forward to telling you about two more Patients who came into the Toy Animal Hospital (https://www.etsy.com/listing/670854959/dinosaur-toys-rejuvenated-animal-toy?ref=shop_home_active_1 ) at the same time that TBT was a Patient. It's curious how things happen: we've gone almost 5 years without anyone needing assistance in that quarter: and then we were asked to treat three - very different Toys - all at the same time. See you all next week - fingers crossed! Have a good one everyone! Treatment offered Teddy Bear Thornton - Part Two. Very Happy Mothering Sunday wishes are sent to all Mums and Grandmothers who may be reading this story today (oh, and everyone Else too!). That's what Mother's Day is called here in the UK, and it's always celebrated on the Fourth Sunday of Lent. In some churches all the children at the main Sunday service are still given small bunches of flowers (usually daffodils - and when they used to be wild in the UK, primroses), which they then give to their Mothers. Some churches still do have that lovely ceremony, I'm told: but being a Beaver Lamb Bear, I've never attended one myself. Do like the idea, though - so I hope it will continue (and prosper) in the years to come. Now, back to the story of Teddy Bear Thornton (TBT for convenience here) and his treatment in the Coldham Cuddlies Animal Toy Hospital - https://www.etsy.com/uk/listing/670854959/dinosaur-toys-rejuvenated-animal-toy?ref=shop_home_active_1 When the mohair fabric arrived from Isobel's supplier, TBT and I inspected it with interest. The furry blanket on which TBT and I are sitting happens to match TBT's paw covering well, doesn't it? We think it was a pretty good match, given the passage of time, adventures and other events, including life in an attic for an indeterminate period, that TBT had survived. Also the fact is that dyes and fabric manufacturing has changed over the several decades we're talking about. (When matching mohair for repair purposes, it's actually the backing fabric into which the mohair is attached that is used to get the results being sought - not the outside furry bits). Meanwhile, TBT's individual pieces - or those that were usable anyway - having been washed, dried and pressed flat were used by Isobel to create templates so that the new body could be cut out. Here were all the pieces that were required for Isobel to put TBT back together. (The smaller pieces are the original, rescued bits, together with its' matching new one). He actually had more bits than she is used to having when making a Coldham Cuddlies Bear these days, but once she had worked out exactly how they fitted together, sewing began - and proceeded quite quickly, once all the original pieces had been matched and tacked together. Where possible, Isobel actually sews each original piece to its matching component in the new version (with the wrong sides together - furry side on the inside of the finished toy). It means the original Teddy Bear still "exists", even if it can't be seen - and it also reduces the need for too much extra stuffing. Many Teddy Bear owners are also much happier thinking that their old friend is still with them (rather than consigned to general waste) - and actually results in a slightly larger Toy in the long run because the new version's seams have to be that much bigger. So, more Teddy Bear to hug eventually! TBT coming to life - the mouth is almost exactly where it showed on his original pieces. Inspecting TBT on arrival, we noticed that he'd come with signs of having a brown woollen embroidered nose and other facial features - but as most Bears usually have black ones, Isobel decided to give him the latter colour. We used his particularly well kept eyes. His ears, having been cut off to be used in the matching process, Isobel provided a completely new pair, without using the original ones - which had shown more wear than the rest of TBT's original body pieces. (Ears often do get used to "haul" teddies around by their devoted owners! Not that I'm saying that actually happened to TBT, you understand!). All that was required then was to "build" the new look TBT - ready to be sent to MrsAT in time for planned the Christmas 2018 hand over. I'll show you the finished article next time around, as well as some lovely photos sent when TBT and his Forever Friend, MsAT met on Christmas Day. Meanwhile, do hope everyone has a terrific week - whatever you are planning to do. See you all then! Hello Everyone from your Friend, Cy Bear. Once again, thanks to a mixture of technical issues (solved for time being, seemingly - fingers tightly crossed!) and off line matters needing Isobel's attention (both at home and elsewhere), blogging has had to take second place. However, today, we're hoping to once more start a regular routine - until the next "issue" takes over!! Since we moved to Nottinghamshire in 2014, the services of our Animal Toy Hospital haven't proved that popular. We did try a spell of advertising on a countrywide advertising platform, but didn't get any response. After a time lapse though, we received unexpected enquiries from several different sources, and we have three recent patients in the Animal Toy Hospital to tell you about, so let's first introduce you to a magnificent Teddy Bear who arrived with us in November last year. He didn't actually have a name when he arrived, was well into his sixties in age, and belonged to a lady, MrsAT who hadn't realised he was still "alive". 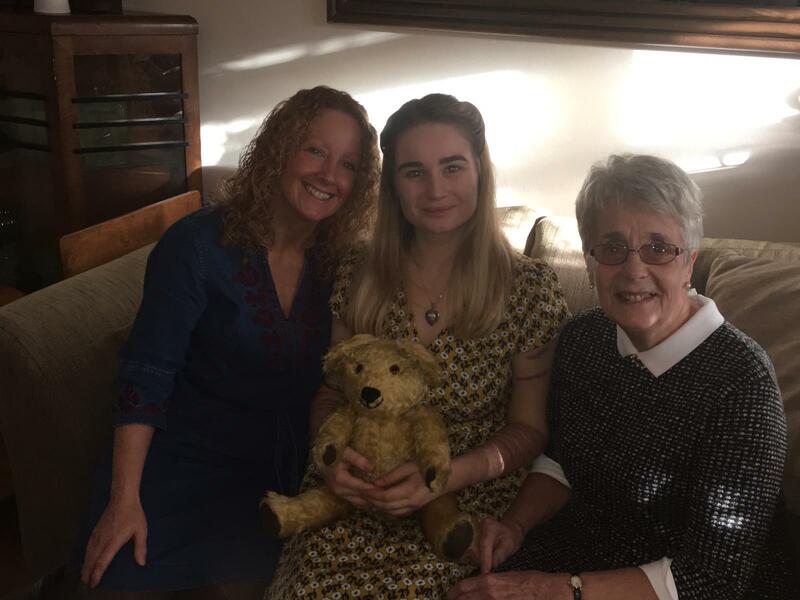 Her sister was involved in downsizing her home, and when clearing her attic came across the Bear - which both ladies thought had been thrown away long ago. (Different versions of this account are such a familiar story in the Teddy Bear world, by the way!). 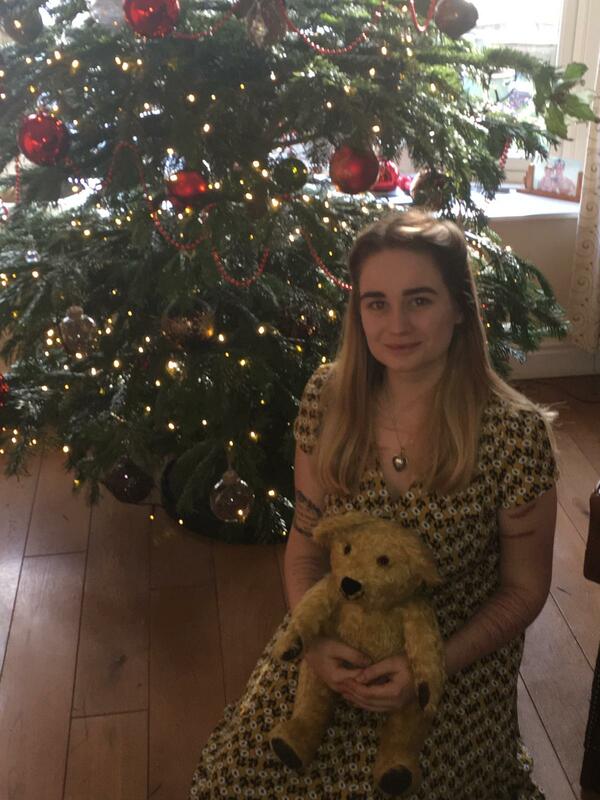 MrsAT had been given him by her Grandfather, and she decided she'd like to give her Grand Daughter MsAT (she's at University, rather than being a "little girl", which is why I'm calling her this) this Bear - renovated - as a Christmas present. MsAT, who apparently likes vintage/old things, was over the moon at the idea, so MrsAT - having found our Animal Hospital via Google, asked Isobel to have a go. Isobel promised to give him back looking as nearly as he might have done at the beginning of his life - but as everyone knows, she cannot duplicate new toys exactly, and restoring someone back to his youth when one is quite a lot older (especially without photographs) can be an additional challenge. One thing that was agreed on from the start though, was that TBT's eyes would be used in his new look. As there was just a faint trace of his original mouth left on his face, Isobel said she would try to copy that as well. How we did, we will show you later. TBT travelled by post from Rotherham, South Yorkshire (which is not too far away from us here in Nottinghamshire) and he just fitted in nicely to the box you see him in. That was kept for him to travel back in, together with the packaging which you can also see. TBT's treatment took the usual format - beginning with Isobel unpicking the seams that made him in the first place. (The pink paw pads were obviously an addition to his original ones, which were actually red baize ones from what we could see - unless, those too, had been a replacement for the more usual brown pads that Bears of this age usually have). Why do we think this? Isobel suspects that TBT could well have had some past trauma (such as being involved in wartime bomb damage perhaps, and was restored so MrsAT could continue to love him). That scenario could well explain the mixture of stuffing (using anything/everything available at a time of wartime shortages) with which we found him when we were carrying out the restoration project. MrsAT was unable to substantiate that thought: so we will never know, nor do we really need to. Parts of the original mohair covering was pretty thin by now, so it was difficult at times to keep it in one piece. However, Isobel managed to do it sufficiently to save the necessary pieces for use in the restoration process. Here are some of the stages BEFORE his original pieces were given a luke-warm soapy bath, rinsed and then left to dry naturally. Beginning with the head: his nose had wood chip stuffing, plus an unknown woolly stuffing for the rest of it. While this process was going on, Isobel had taken one of TBT's ears, and sent it to our Mohair Bear fabric suppliers, who came back with the best match he could find - given the time lag between his original arrival in MrsAT's family and 2018. (We learned that our supplier was assisted in this process by another professional animal toy restorer- just happened to be in the shop at the time Isobel asked for help, so we know we couldn't have done better! They got a letter of thanks for their help, needless to say!) Isobel discussed it with MrsAT who agreed that construction of the new look TBT could go ahead. I'll tell you all about that process the next time we get together. Hopefully that will be next week: in the meantime, have a great week Everybody - and here's to the next time! Cy Bear back again - and so pleased to be too. Thought I'd begin by showing you this: the beginning of a new look for Coldham Cuddlies. Currently, this is only visible at the head of our Shop Page - and is the result of wonderful help provided by one of Isobel's Etsy friends and a Leader in one of the Teams of which Isobel is a member. We've retained the original Orange, Green and White of our corporate colours (if you can call us "corporate"!!). Our friend has always been there for Isobel when she gets into Team technical difficulties (rather more frequently than Isobel likes, really!). We've had the banner you can see at the head of this post since the early days of ColdhamCuddlies in 2010 (provided, then as well, by a kind fellow Etsian - because we wouldn't have known where to begin!) and Isobel decided that the arrival of 2019 was perhaps a good time for a change of "look"! We plan using a version of the new banner here soon - when we're sure that technical glitches are over - and also with our business cards. But we've got a large number of those with our existing design to hand out, so that will have to wait for a bit. Sorry we were missing last week, but yet again, a technical glitch caused Isobel to be temporarily deprived of access to the laptop. She has, however, been getting better acquainted with her smartphone (about time, I would say - given that she's had one since it was acquired in November 2017 - in time for the Winter Christmas Bazaar at Thoresby Hall!). That's happened, because she's found some books that explain exactly how to use a smartphone, and they've really helped her! That did enable her to keep abreast of some developments in our Shop, even though all is not well there, either. The listing pages for the Shop are subject to hiccups (caused since technical changes by Etsy itself - the platform from which all the Coldham Cuddlies' activities are launched) Everyone involved with Etsy.com have been affected in one way or another, and it's taking time for us to all get used to the new changes. As regular readers of this blog will know, we do make Bears that are bigger than the recently introduced Clerical Bears, and in recent months, we've made three of our Big Plush/Faux Fur Bears - as well as having a couple of Patients staying in our Stuffed Animal Hospital -https://www.etsy.com/uk/listing/670854959/ (that's another story, though!). 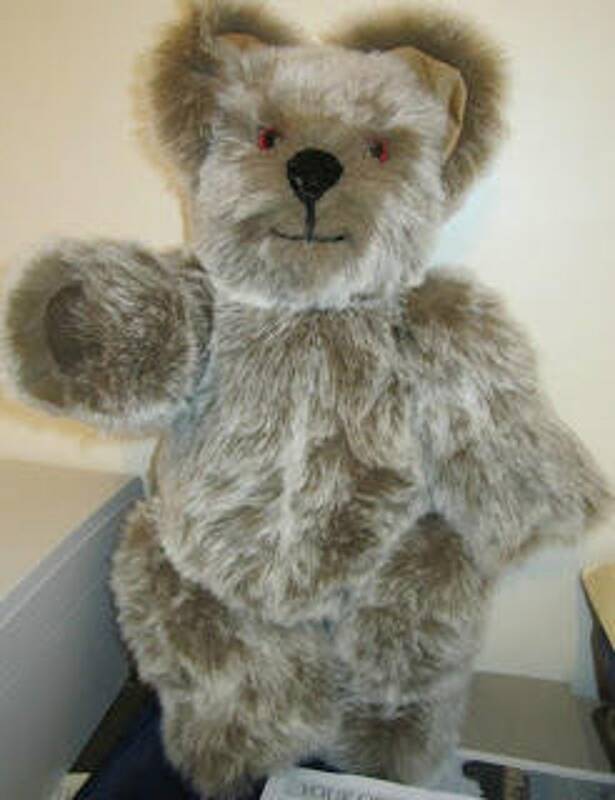 We have also been asked to make an Elizabethan Bear (see photograph below), using the Clerical Bear pattern as a base. This was the result of an order from our good friend, MsKA - who asked Isobel to make seven versions of my good friend, Oscar Blue Rabbit early last year (2018). Then one of Isobel's Friends from St. Barnabas Cathedral - and a long time family friend of the family - asked us to provide two plush Teddy Bears for young friends of hers who were leaving the UK to live with their parents in Papua New Guinea. This she did, and here is a photograph of the two of them before they left us to meet their Forever Friends. It looks as though this Bear is going to become a Lady Bear - which is a somewhat unusual outcome for us Coldham Cuddlies! She is possibly going to be named "Izy" - according to MrsGW, who has become a friend of Isobel over recent months, while both of them attended the weekly session of one of the local Slimming World groups. She loved a farewell photo she was shown, before the 14th Hairy Bear left us - just before Christmas 2018 to live somewhere in Leicestershire, UK. Izy was handed over yesterday (and is due to join a seemingly large collection of Teddy Bears). With that outcome, I'll end this week's post. 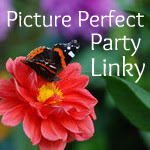 We're gradually catching up with the events of the last few months when this blog was temporarily off line. But there are still a few more items to tell you about, and I hope to be back again next week - provided there are no further technical hitches! Until then, have a great week, Everyone! Glad to be back again, and this time with only our usual break to deal with. We're still as busy as we were last week, but Isobel is about to complete the final order received pre-Christmas (off-line) and then we will be able to keep to our previous regular order schedule. This week has seen the arrival of another order for a Brown Sister Bear (a picture of her is included at the end of this post)- and as she has not been commented on in a post from us before, Isobel thought it appropriate for us to bring you up to date about what has happened in this sphere of the Coldham Cuddlies World since September last year. The photograph below shows what the original group looked like (with me supervising "The Bunch") when they were all ready to be presented to the outside world - pre the Artisan Craft Fair in October 2018, which was their official presentation date. They had actually been unofficially introduced to the St. Barnabas Cathedral Parish before the Craft Fair, when Isobel displayed them throughout September between 0900-1200 every Sunday during the weekly Coffee Mornings that follow the two Masses - and they generated a lot of interest, as well as potential orders: some of which did actually follow through! We'd already received an order for Padre Bear 1 (front right, next to one of the Missionary Bears), who winged his way to Tulsa Okalahoma once this photograph was taken). His departure was followed quite quickly by an order for a Bishop Bear - which came from a London, UK customer, with suspected links to the Anglican Church, because of the address to which "His Grace" was sent. As I said last week, to date the orders that have been received - and completed - have resulted in £70.00 ($90.25 USD) being paid into the St. Barnabas Cathedral Restoration Fund. 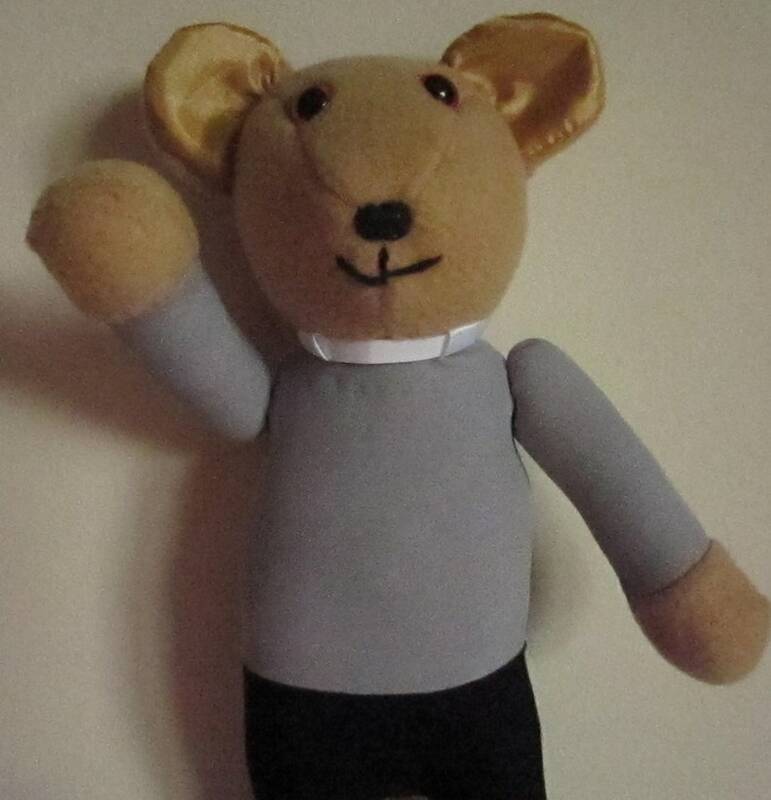 We've got £15.00 ($19.34 USD) waiting to be paid over to the Fund, and last evening received another order from MsCW - resident of Lawrence, Kansas, USA - for a "Brown Nun", which joins another similar version of our Sister Bears, which will head off to Tulsa, OK when she is made very shortly. That will result in a cheque for a further £25.00 ($32.24 USD) being handed over to the Cathedral Dean, once these two ladies have been cut out, sewn and completed. As the weeks have passed, Isobel decided that our original Sister Bear (seen in the first photo here) looked a little "bare around the neck, so that when the first orders arrived for an Original Sister Bear (we're not going to call her a "Black Sister" for obvious reasons), all future versions will now look like the second Sister Bear (which headed for the same Tulsa home that Padre Bear went to) a few weeks into the sales season. Isobel also intends to add a collar around our original Sister Bear, but she's been so busy what with one thing and another, that there's been no time to dress her properly!! We're hoping to redress this omission shortly though! Our Tulsa-based friend, MrSS was our original first enthusiastic customer for the Clerical Bears and stated his intention of buying at least four different members of the Collection, including Padre Bear and the initial Sister Bear (with collar attached!). Now, Isobel knew that MrSS lives in an area of Oklahoma, which is served by an Order of Nuns known as the Order of Holy Spirit Adoration Sisters - who dress themselves in a Pink and White Habit. Presently, we have two different Orders of Sisters serving the Cathedral, one of which is known as The Little Company of Mary. They are based in Hyson Green, a part of the City of Nottingham, where they were originally founded, and the current Leader of the local Community, Sister AMcD has become very friendly with Isobel since she and the Bears made each others' acquaintance last September. Just before Christmas, Sister A asked if Isobel could make a Bear replica displaying their somewhat unique colour veil. It took some doing, but eventually we were able to find some fabric which provided a pretty good match for their head dress. It has recently resulted in the appearance in our Shop of our "Blue Nun"
We have been told that Sister Blue Nun now occupies a prominent position in the Little Company of Mary's Hyson Green Heritage Centre - which Isobel intends to visit to learn more about the Order's work sometime soon (when time allows). On 7th February, a special celebration Mass was held in the presence of Bishop Patrick McKinney, Bishop of Nottingham, to commemorate the 30th Anniversary of the Order's Founder, Venerable Mary Potter being declared Blessed by Pope St.John Paul in 1988. Blessed Mary Potter's remains are actually interred in the Cathedral - and at the service, a special banner (created by Members of the Cathedral Artisan Crafts Group) to commemorate this Anniversary was blessed by the Bishop. (Isobel belongs to this group, and the proceeds of our sales of the Clerical Bears do get included in that Group's overall contributions to the Cathedral Restoration Fund). They were originally intended to respond to an order from another St. Barnabas parishoner, who has bought several Clerical Bears - for herself, and as gifts for her friends - as well as be the final purchase from MrSS. However, while making them, Isobel got a little "wild" with the iron, when pressing the hem of the Sister Bear she was then working on - and although the scorch doesn't show, Isobel knows about it: and that makes it definitely not suitable to offer as a new Clerical Bear in our Shop!! So, this "damaged" Sister Brown Bear is going to join in the Coldham Clerical Bear Collection - so she can be seen (but not too closely!) 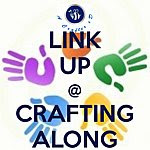 when they are called upon at future Craft Fairs - or special anniversary events at the Cathedral, which in 2019 celebrates 175 years since it was originally built!! More of that anon, I am sure!! So, we've brought you up to date with what has happened with the Clerical Bears - and look forward to telling you about other activities in the Shop during the period when our communications has been interrupted. See you next week, hopefully.